Biodiesel derived from oil crops is a potential renewable and carbon neutral alternative to petroleum fuels. Microalgae, like higher plants, produce storage lipids in the form of triacylglycerols (TAGs) which can be used to synthesize fatty acid methyl esters (a substitute for fossil-derived diesel fuel). Microalgae represent a very attractive alternative compared to terrestrial oleaginous species because their productivity is much higher and it does not compete for land suitable for agricultural irrigation or consumption by humans or animals, providing therefore food security. To date, commercial application of microalgae has concentrated on compounds that have a very high value per kilo (e.g. carotenoids). To be a feasible source for biodiesel, the current price for microalgae production needs to be reduced by two orders of magnitude. In addition, the scale of production of lipids from microalgae would need to be three orders of magnitude greater than the scale currently possible for high-value compounds. These ambitious goals are feasible because the potential productivity of microalgae is tenfold greater than that of agricultural crops. However, the promises of several companies in the field combined with expectations from the market have led to unrealistic predictions for the potential of microalgae. There are companies that promise to produce an amount of biodiesel from microalgae that is either near or in some cases higher than the maximum amount achievable. In areas with high irradiation the theoretical maximum productivity of 280 tonnes of dry biomass per ha per year could be produced (see photosynthetic efficiency). If we then assume a lipid content of 40% in the microalgae, the total amount of oil that can be produced is 115,000 L ha-1 year-1. However, these productivities are unrealistic at this point in time. With state-of-the-art technology, it might be possible to produce in the order of magnitude of 20,000 L ha-1 year-1 of oil – this is still significantly more than can be obtained from energy crops (the areal productivity of palm oil is 6,000 L ha-1 year-1). The photosynthetic efficiency (PE) is defined as the fraction of light energy fixed as chemical energy during photoautotrophic growth. Minimally 10 light photons (quanta) are required to produce one mol of O2. Taking a representative biomass composition (CH1.78O0.36N0.12) this corresponds to 14 quanta needed to fix one mol of CO2 into biomass based on ammonium as a nitrogen source. Finally, one mol CO2 fixed results in one Cmol of biomass (= 21.25 g dry weight) with an enthalpy of combustion 547.8 kJ×Cmol-1. In photosynthesis only light of wavelengths between 400 and 700 nm is used, this represents 42.3% of the energy of the total spectrum of sunlight and it is called photosynthetic active radiation (PAR). The average energy content of these quanta is 218 kJ/mol quanta. Combining all these data it is calculated that maximally 9% of sunlight energy (considering all wavelengths) can be converted into chemical energy as new biomass. Only considering the PAR range the efficiency is 21.4 %. Based on solar irradiation data as can be found e.g. on http://re.jrc.ec.europa.eu/esti/index_en.htm it can be calculated that the maximum theoretical biomass productivity is e.g. in the south of Spain is 280 tonnes ha-1 year-1. Many species of microalgae contain high concentrations of lipids. In general, nutrient deprivation induces lipid accumulation in the cells and is accompanied by a decrease in total (and total lipid) productivity. However, the actual mechanism that triggers accumulation in unclear. In table 1 the concentration of lipids in different microalgal strains is given. A huge variety of cultivation systems for microalgae have been developed. 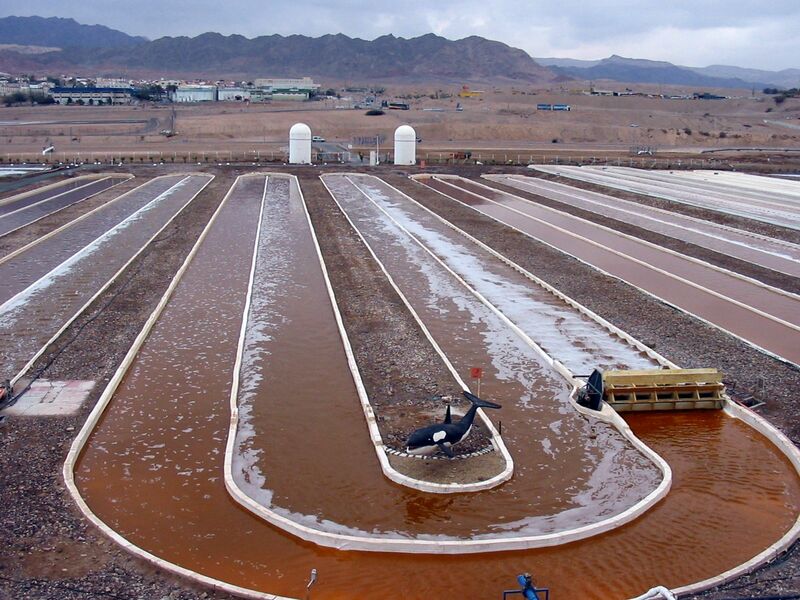 Most of the large-scale production facilities currently realized for microalgae are raceway ponds (Figure 1 left). Because of their simplicity and the low investment costs involved it is often assumed that these are the best systems for biofuel production. Closed photobioreactors, such as tubular photobioreactors (Figure 1 middle) and flat panel reactors (Figure 1 right), can result in higher productivity but at the expense of higher investment costs. Left: Raceway pond at Nature Beta Technologies Ltd (Eilat, Israel), a subsidiary of Nikken Sohonsha Co. (http://www.chlostanin.co.jp) (Gifu, Japan). These ponds are usually no more than 30 cm deep and the water, containing nutrients and microalgae, is circulated with a paddle wheel. 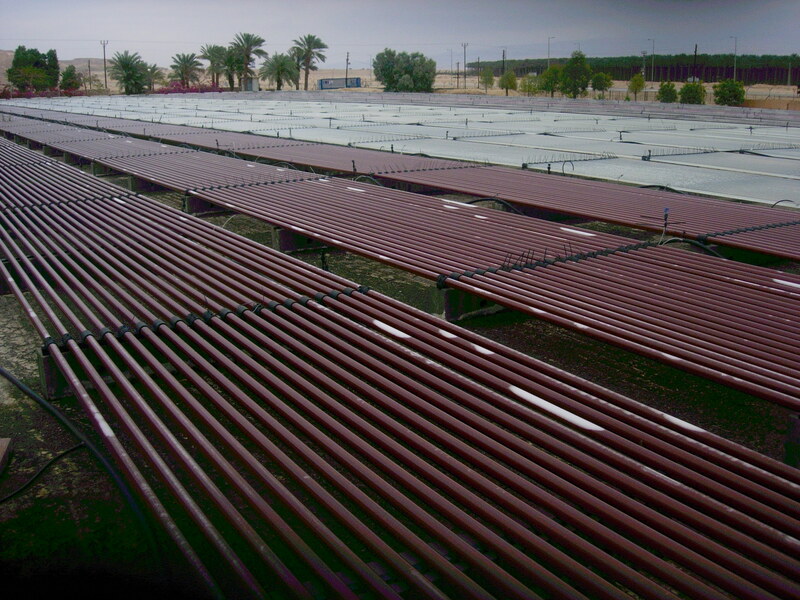 Middle: Tubular photobioreactor at Algatechnology (http://www.algatech.com) production site (Ketura Arava Valley, Israel). Tubular photobioreactors consist of long transparent tubes with diameters ranging from 3 to 6 cm and lengths ranging from 10 to 200 m. The culture liquid is pumped through these tubes by mechanical or air-lift pumps. 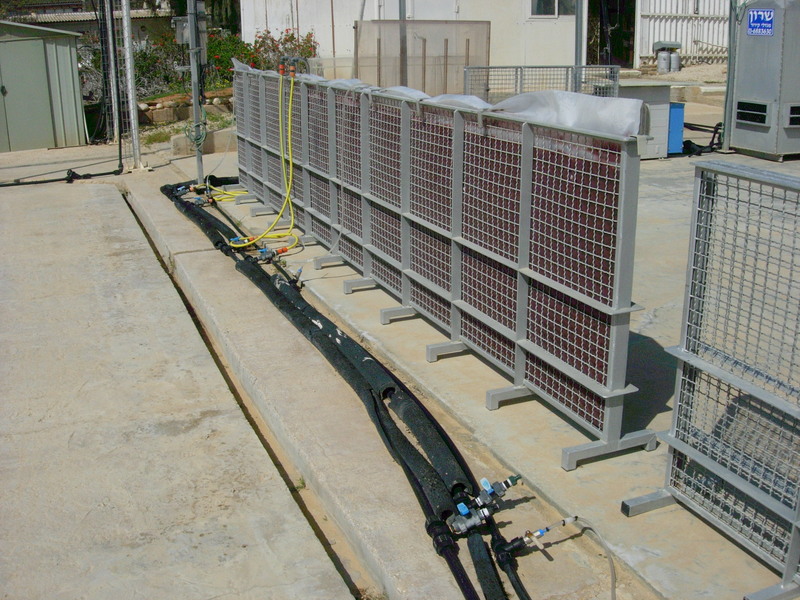 Right: Flat panel photobioreactor, Sede Boker campus, Ben Gurion University of the Negev, Israel. Flat panel reactors consist of a rectangular transparent box with a width only 1 to 5 cm. These photobioreactors are mixed with air introduced via a perforated tube at the bottom of the reactor. For Delta, one of the energy companies in the Netherlands, we executed a feasibility study of producing microalgae and compared 3 production technologies: open pond systems, tubular system and a flat panel photobioreactor. The analysis was based on state-of-the-art technology for the solar conditions in the Netherlands. Estimations were conservative, which means that for reaching estimated productivities there is no need to develop systems or processes further than is now possible. In this analysis we also assumed that nutrients for the growth medium and CO2 had to be bought. The end product of the process we designed is an algal paste with a dry matter content of 20%. Extraction of oil and esterification was not considered in this process. The designs we report here are for a scale of 100 ha. Microalgae biomass can be produced cheaper in photobioreactors than in raceway ponds, but this is achieved at the expense of higher energy consumption. When comparing the two photobioreactors, the horizontal tubular reactors and flat panels show a similar biomass production cost. Regarding energy balance flat panels perform a bit better, even though both systems have a negative balance. Sensitivity analysis showed that production costs can be reduced significantly. It was shown that if nutrients are obtained for free if production is combined with e.g. wastewater treatment or if CO2 is obtained from stack gases from a power plant production costs are reduced with 0.77 €/kg DW. The production technology could be improved as well, e.g. by developing systems with higher photosynthetic efficiencies, development of systems where less pumping energy is used or where less energy is used for harvesting of cells. In that case the production costs can be reduced with as much as 3.- €/kg DW. Technology advances might make it possible to develop more realistic and economical processes. It can be estimated that doubling the productivity and reducing the energy input in mixing, combined with CO2 and nutrient removal from waste streams and their use in high radiance areas could significantly reduce costs. The production costs could become as low as 0.42 €/kg DW. If this was combined with the use of the microalgae produced in other applications (a biorefinery approach) the commercial production of microalgae could become a realistic option for the biofuel market. Productivity could be enhanced considerably. It has been shown in the laboratory that high productivities can be reached with strong sunlight in photobioreactors with short light paths.